I mentioned awhile ago that I finally purchased a pair of Lucky Lou wedges. A pair of shoes I've been wanting for six years and definitely worth the wait since they finally added ankle straps to the shoes. I love ankle straps! Even though it's only April I've been fortunate enough to wear them several times already. Once to a tiki party in February (yes, that was very cold but so much fun) and a few times on various trips to Louisville. On one particular trip in Louisville, James and I spent the day with my mom on Sunday and visited a Peddler's Mall. 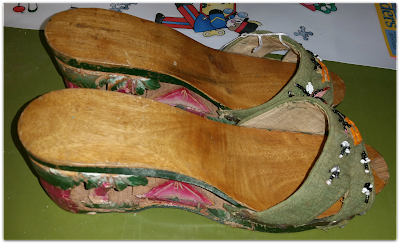 To my delight, I found an actual vintage pair of carved slides - the original design for which Lucky Lou's replicate! I was pleased to show my mom, as she said she had never seen shoes like that before. Earlier that day we had visited my grandmother - she remembered shoes that looked like mine and probably had a pair but had long since given them away (*groans*). Vintage souvenir slides or mules, sometimes referred to as bahaykubo, are carved, wooden shoes often made in the Philippines. These shoes were popular in the 1940's as American GIs would purchase the shoes and bring them back home as presents for their sweethearts after the war. 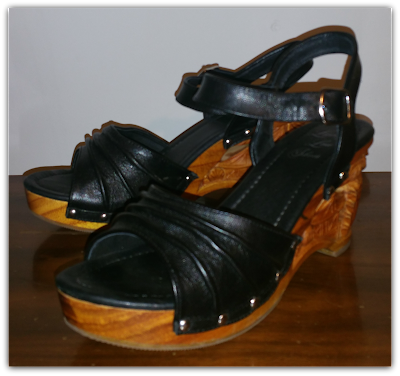 Lucky Lou Shoes are reproductions of the original souvenir slide yet still hand carved in the Philippines! While I would love a vintage pair of souvenir slides, it's difficult to find a pair in wearable condition and even harder in my size. 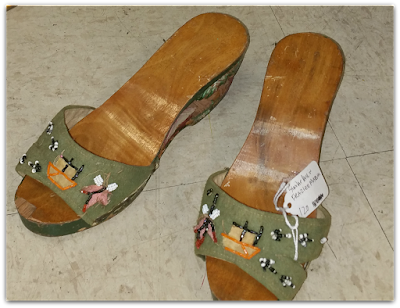 Lucky Lou boasts a wide selection of not only the famed souvenir slides but additional carved tiki shoes/heels with and without ankle straps, in various colors. In fact, I was such a fan of my long awaited souvenir slides that I also purchased the Cherry Blossom carved heels in peacock blue! I cannot wait to wear those! Check back next Monday for my review of the Souvenir Slides!